Both private & govt hospitals in western Uttar Pradesh say they are struggling to buy supplies & pay staff. Ghaziabad: Rajkumar Bansal, a 53-year-old helper at a local retail store in Uttar Pradesh’s Shamli district, had given up hope on getting treatment for his heart condition. But that was before he enrolled under the Modi government’s ambitious healthcare insurance scheme, Ayushman Bharat. Now having undergone a heart bypass surgery, Bansal is relieved because, with his monthly income of Rs 7,000 and a five-member family to feed, he believed that treatment was out of the question. For patients such as Bansal in western Uttar Pradesh, the Pradhan Mantri Jan Arogya Yojana, popularly known as Ayushman Bharat, is turning out to be a boon. Under the scheme, beneficiaries can undergo free treatment at private and public hospitals, which can then claim the money from the government. The hospitals, however, aren’t as thrilled yet. Several of them, both private and government-owned, complain that they are not being reimbursed on time. According to the data with the office of the chief medical officer, Ghaziabad, the district has filed 655 claims for Rs 58 lakh since the launch of the scheme in September, of which 401 claims worth Rs 33 lakh were pending on 4 February. The hospitals say that they fear getting trapped in a delayed cycle of payments. Indu Bhushan, CEO of Ayushman Bharat, however, told ThePrint that the hospitals would receive the money soon. “We have given instructions to the banks to release the funds and hospitals will receive them at the earliest,” he said, without elaborating on the reasons for the delay. This delayed cycle was the reason cited by a number of private hospitals last year when they refused to come on board the scheme. The hospitals had then pointed out that they were already owed dues from the other insurance-based healthcare scheme — the Central Government Health Scheme (CGHS). 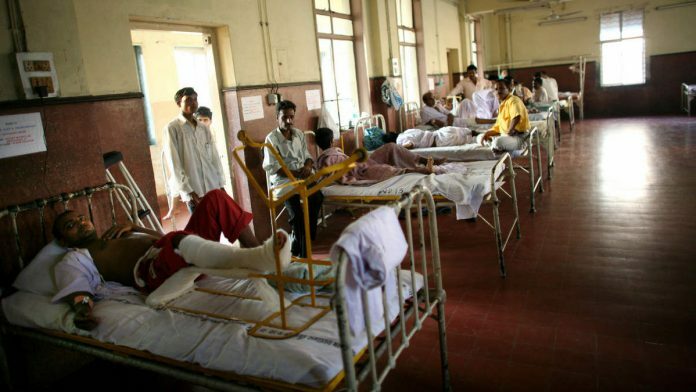 According to the Association of Healthcare Providers, India, which represents 2,500 speciality and 8,000 smaller hospitals, the hospitals are owed over Rs 400 crore under the CGHS scheme. The chief medical officer (CMO) at MMG Hospital, a public hospital in Ghaziabad, said that he has been waiting desperately for the reimbursement of claims submitted. “We have filed claims for the last three months but have not received a single penny yet,” Ravindra Singh, the CMO, told ThePrint. It’s a similar situation at the only public women’s hospital in Ghaziabad. In neighbouring Bijnor district, public hospitals say they are facing a fund crunch due to delayed reimbursements. “From the total 171 claims filed, we have received payments for only 21 claims,” said Dr Natasha, district nodal officer for the scheme. The public hospitals are using money from the Rogi Kalyan Samiti (RKS) fund, which is under the state government’s National Rural Health Mission, to improve their infrastructure. The fund, not more than Rs 5 lakh, is transferred annually by state governments to the local account of the hospitals. Hospitals in Shamli do not complain of delayed payments but officials working for the implementation of the scheme are facing funds crunch. The small team of Ayushman Bharat scheme is waiting for the funds to buy computers, tables, and chairs. Private hospitals in Ghaziabad say the scheme is taking a massive toll on their finances. NHA is the National Health Authority, the body which oversees the implementation of Ayushman Bharat. The Ayushman Mitra of the hospital, Sunita Kumari, confirmed that it has not received payments for any of the claims sent. The Mitra is an official deputed by the Central government to assist the hospital and patients under the scheme. At Yashoda hospital, empanelled under the scheme in Ghaziabad, authorities say they have been reimbursed amounts less than what they expected. Many private hospitals did not want to come on record while discussing their claim status but they all agreed that reimbursement from the government has been delayed since the scheme was launched. This was the payment status till 4 February, the officer added. The Ghaziabad district I-T manager for Ayushman Bharat, Ajay Rawal, confirmed, two days later, that two of Atlanta Mediworld’s claims are pending, adding that pending payment claims from hospitals is the only problem that the district is facing. The hospitals are also questioning the cause for the delay as they say that they aren’t really handling a large number of patients. Uttar Pradesh has the largest pool of target beneficiaries at 118.04 lakh families and around 6 crore individuals for the scheme. But so far, only around 15 lakh beneficiaries have been enrolled (in person) — a mere 2.5 per cent of identified beneficiaries. The implementation of Ayushman Bharat has also hit another roadblock in Western Uttar Pradesh — a lack of doctors. In Shamli district, the administration has applied for delisting three community health centres (CHCs), out of six, from the scheme as they suffer from a shortage of specialists. In Muzzafarnagar, of the nine community health centres, four have not applied to be a part of the scheme due to the scarcity of doctors. Despite teething problems in its implementation, beneficiaries laud the scheme. Bhanwar Singh, 56, travelled all the way from Uttarakhand to the private Amrit Hospital in Shamli district, where stents are being inserted to treat a blockage in his arteries. “As soon as I found out about the Ayushman Bharat scheme, I checked with the hospital in Uttarakhand if I can avail this benefit in Shamli,” he added. The procedure would otherwise cost at least Rs 1.5 lakh to Rs 2 lakh in the private hospital. Shiv Dutt Sharma, whose family of four survives on his monthly salary of Rs 5,000, is being treated for a hernia at the MMG hospital (government-owned) in Ghaziabad. The copy has been updated with Ajay Rawal’s response.